GREEN ACRES: Freeman (Bilbo) and McKellen (Gandalf) in The Hobbit. It goes without saying that the mega-blockbuster The Lord of the Rings: The Return of the King is a tough act to follow, so in returning to that fantasy-ridden storyline that won him worldwide acclaim and a treasure trove of awards, director Peter Jackson has undertaken an immensely risky task. As it so happens, The Hobbit: An Unexpected Journey, which transports viewers to where the adventurous series really began yields mixed results, boasting visual splendour, sweeping cinematography, and regular splashes of humour, but moves at a pace too plodding, and deliberate to truly captivate. 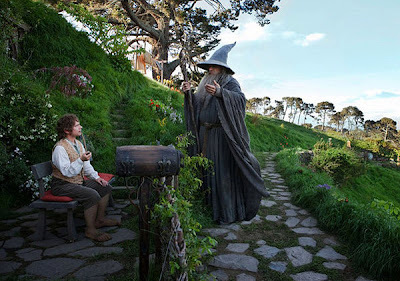 When good-natured wizard Gandalf (Ian McKellen) suddenly shows up at Bilbo Baggins’ (Martin Freeman) place in The Shire with the promise of an epic adventure, the visit sets in motion a series of events that spiral into an odyssey marked by fierce clashes between dwarves (led by the terrific Richard Armitage, looking to reclaim their lost kingdom), elves and orcs – and enough dark magic to last ten lifetimes. Among the highlights, of course, is an appearance by that rascal Gollum, with his “precious” never far from his side.